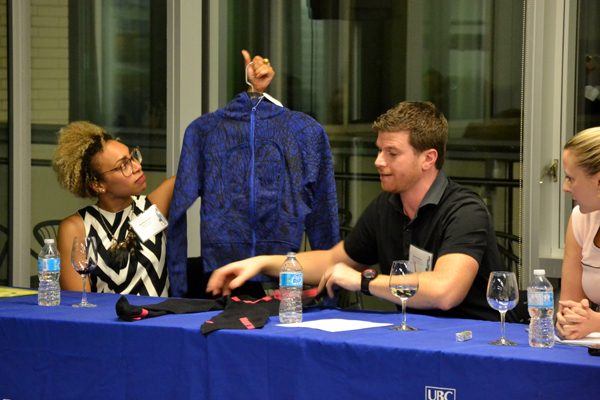 This past Thursday, January 16th, 80 well-dressed students, lawyers and even a few fashion designers attended the very first UBC Fashion Law Panel and Reception at Allard Hall. 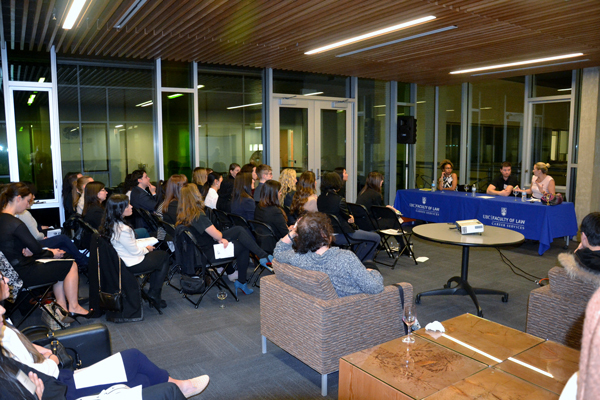 The event was put on in collaboration with Career Services, and featured a panel followed by a reception with delicious food and some networking. Fashion law as a recognized practice area is still in its infancy in Canada, although it has certainly been growing in both recognition and popularity. It touches on a wide range of traditional legal areas including everything from intellectual property, to contract and employment law, as it pertains specifically to the fashion industry (similar to other specialty areas like sports or art law). The Fashion Law Panel brought together several practicing fashion lawyers to explore legal issues related to the fashion industry including the infamous ‘red sole’ case Louboutin v. Yves Saint Laurent, their personal career paths, and what employment opportunities exist in this area. 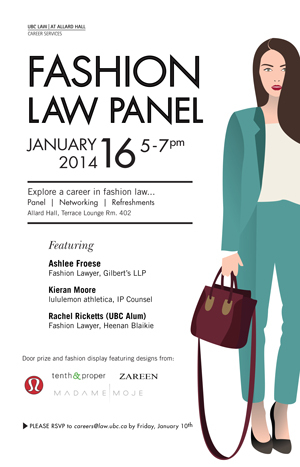 Speakers included: Ashlee Froese, a Partner at Gilbert’s LLP in Toronto who has been very involved in the progression of fashion law in Canada and authors the blog CanadaFashionLaw.com; Kieran Moore, the Intellectual Property Counsel at lululemon athletica; Rachel Ricketts, a UBC Law alumna and Associate at Heenan Blaikie as well as legal counsel for Vancouver ECO Fashion Week; and second-year student Elaine Choi who spent the summer after first year as a legal intern for Aritzia. Several clothing designs were on display from local labels Madame Moje, Tenth & Proper, and Zareen; as well as a lululemon mannequin clothed entirely in patented designs (IP is a huge part of fashion law). Rachel Ricketts holding a counterfeit ‘lululemon’ hoodie, with Kieran Moore and Ashlee Froese. One of the most inspiring messages of this evening was to have the courage and determination to pursue your interests in the legal field, particularly if you are passionate about a specialized area. There will always be naysayers, but these panelists are proof that you can successfully combine your passion with your legal career. Attendees look on during the Q&A period. 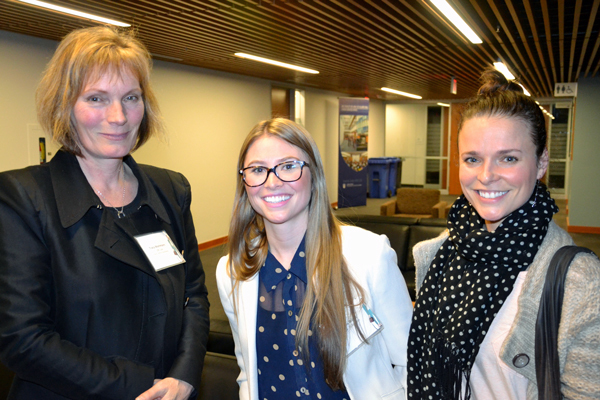 Panel attendees Tracy Wachmann (Career Services Office), Tasha Wood (2L), and Myriam Laroche (President, Vancouver ECO Fashion Week). Patented designs from lululemon athletica. This entry was posted in Uncategorized on January 20, 2014 by lindsayd. The clothing style, the last picture is my favorite type, color would be even better light point!